Give credit where it is due… Donald Trump has had a very positive effect on not only the stock market, but the job market. ADP released numbers today and US companies added a stunning 298,000 jobs in February. That’s 100,000 more than expected. Those are the strongest numbers since August and September 2015. The trajectory for growth at the moment is off the charts. No wonder President Trump is all smiles today. 66,000 construction jobs were added and 32,000 manufacturing jobs as well. Not bad… not too bad at all. It’s quite a change from the disastrous job numbers under Barack Obama. The unemployment rate is expected to be lowered to 4.7 percent, which is still fiction. That particular number means nothing anymore. ADP’s report is mirrored by another from LinkedIn, so the good news is definitely fact. This is all Trump… it’s his force of will and the numbers are a direct result of his actions. So, take a moment and give a round of applause to Trump. Despite all the drama and chaos, he’s making the country better. Now, if he can just fix that pesky healthcare bomb dropped yesterday. U.S. companies added a whopping 298,000 new jobs in February, beating economists’ expectations by more than 100,000. 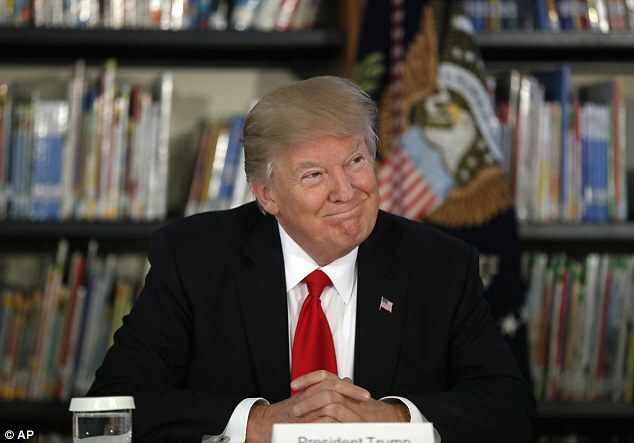 The report from ADP, a global human resources and payroll firm, provides the first hard economic numbers from Donald Trump’s first full month as president. 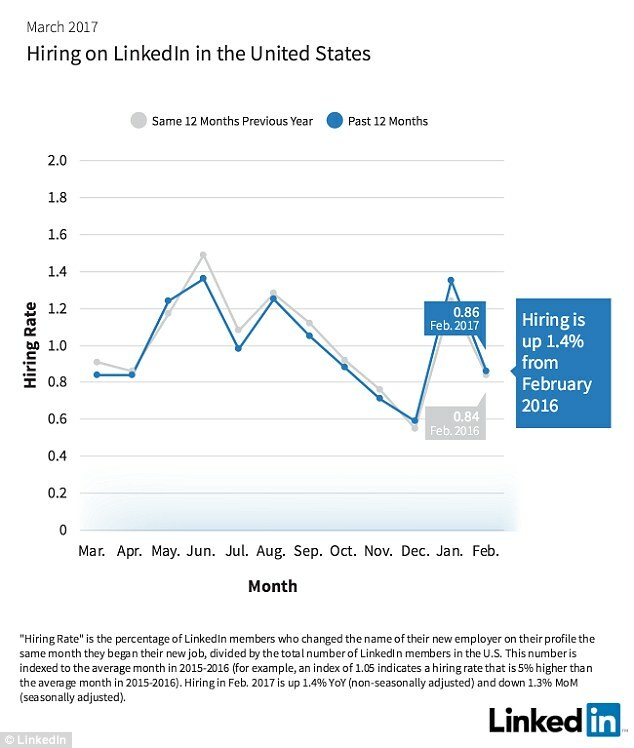 He also wrote Wednesday on Twitter about another similar measure, citing numbers from a new LinkedIn workforce report that showed strong job-adding numbers from January and February. 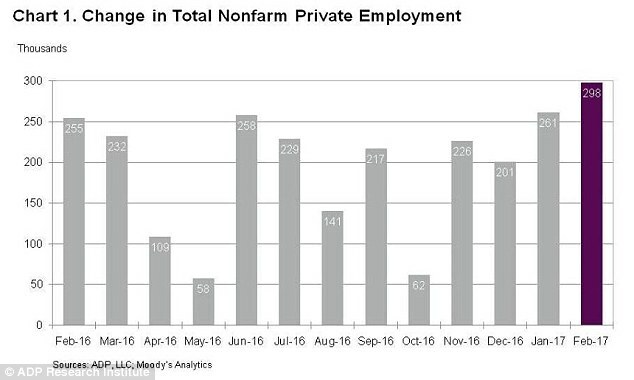 Those months ‘were the strongest consecutive months for hiring since August and September 2015,’ the president tweeted, mirroring the report’s language. Construction jobs increased by 66,000 in February, and the manufacturing sector added 32,000. Trump has pledged to dramatically improve the U.S. employment market in those sectors as he tries to lure businesses from overseas and stop jobs from fleeing across the border. He has also promised $1 trillion in new infrastructure spending, another measure calculated to add jobs. ‘February proved to be an incredibly strong month for employment with increases we have not seen in years,’ Ahu Yildirmaz, vice president of the ADP Research Institute, said in a statement. I know that many jobs will also be added as President Trump’s $1 trillion infrastructure plan comes together. That’s great news for jobs, but I’m still really fuzzy on where the money will come from. One step at a time, I guess. January’s new jobs numbers were also revised upward on Wednesday from 246,000 to 261,000. There is a lot of confidence in the business world out there with Trump at the helm. Something that was non-existent under Obama. “Confidence is playing a large role,” Mark Zandi, chief economist of Moody’s Analytics, told CNBC. “Businesses are anticipating a lot of good stuff – tax cuts, less regulation. They are hiring more aggressively.” Let’s hope all of that comes to fruition. There was a notable shift away from the service-sector positions that have dominated hiring for years. These are blue collar jobs for the most part. It would also be nice if we did away with H1B visas so that IT jobs multiplied for actual Americans. But this is a great start.